The Relevancy and History Project is a partnership between the University of California, Riverside, and California State Parks. 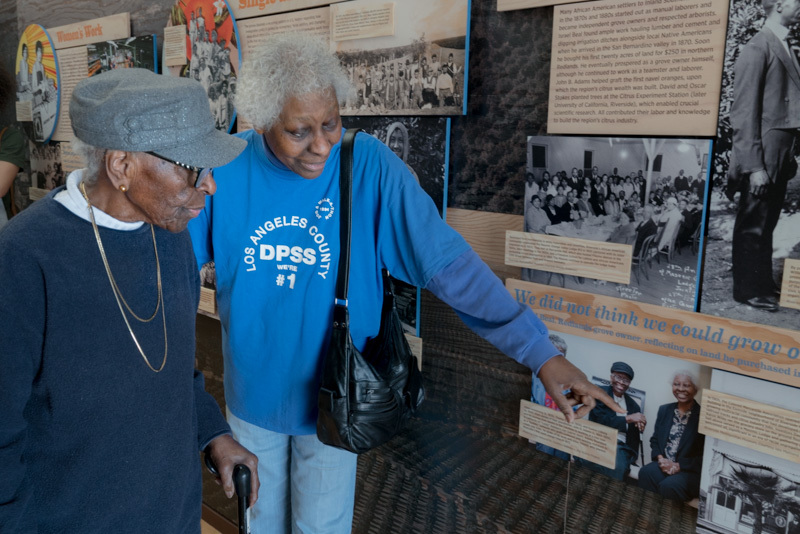 The pilot project at California Citrus State Historic Park focuses on migration and immigration and highlights hidden histories of people and place. It includes new research, partnerships, student participation, community story collection, outreach events, and exhibitions. For more information or to share your stories, please contact RHCitrusPark@gmail.com. 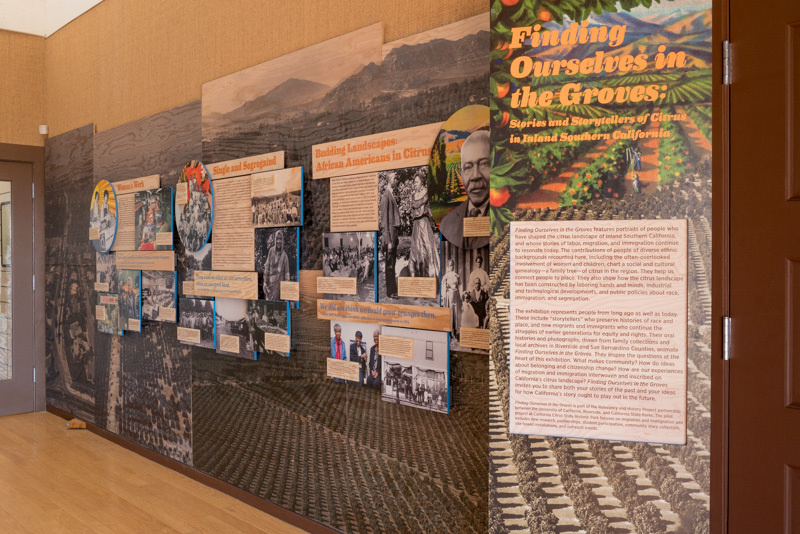 Finding Ourselves in the Groves features portraits of people who have shaped the citrus landscape of Inland Southern California, and whose stories of labor, migration, and immigration continue to resonate today. The contributions of people of diverse ethnic backgrounds recounted here, including the often-overlooked involvement of women and children, chart a social and cultural genealogy—a family tree—of citrus in the region. They help us connect people to place. 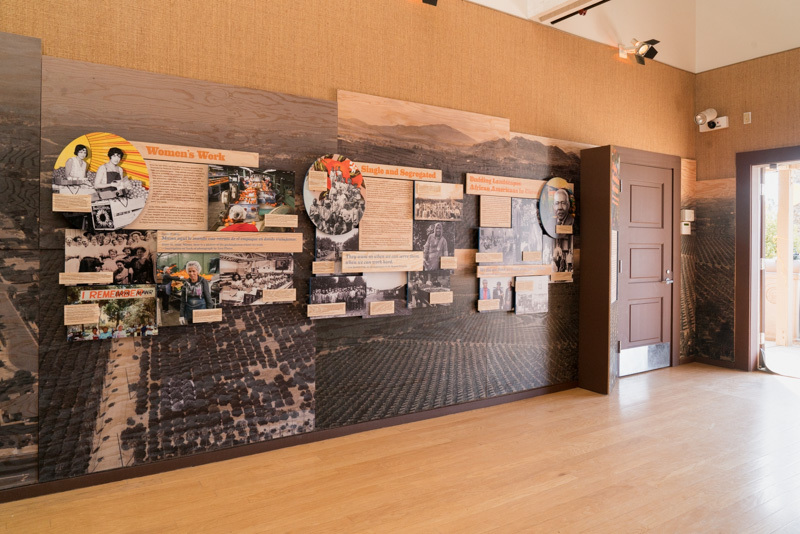 They also show how the citrus landscape has been constructed by laboring hands and minds, industrial and technological developments, and public policies about race, immigration, and segregation. The exhibition represents people from long ago as well as today. These include “storytellers” who preserve histories of race and place, and new migrants and immigrants who continue the struggles of earlier generations for equity and rights. Their oral histories and photographs, drawn from family collections and local archives in Riverside and San Bernardino Counties, animate Finding Ourselves in the Groves. They inspire the questions at the heart of this exhibition. What makes community? How do ideas about belonging and citizenship change? How are our experiences of migration and immigration interwoven and inscribed on California’s citrus landscape? Finding Ourselves in the Groves invites you to share both your stories of the past and your ideas for how California’s story to ought play out in the future. Artist Arnold Martin fabricated two stereographic viewers, known as “stereoviewers” for short, which currently hold mini-exhibits: “In the Groves” and “Packing ‘Em Up” as part of the Sweet & Sour: Laboring Landscapes of Citrus series, a 3D glimpse of the people who put citrus onto the map of California and into homes around the globe. Manos, Espaldas, y Blossoms (2017) is a collaborative art project by poet Juan Delgado and photographer Thomas McGovern that features the laborers who pick citrus harvested from groves at the park. 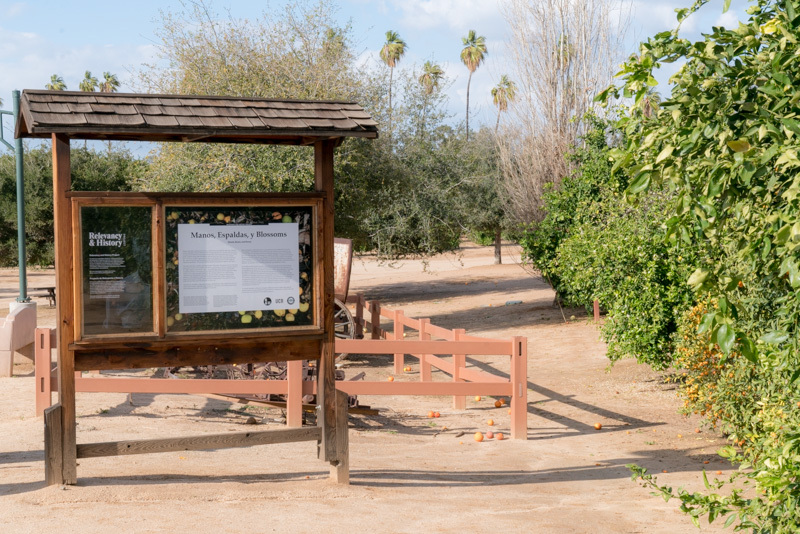 The twenty photomurals and “poetry posts” installed along paths through the park put into view what we rarely consider when we eat an orange or gaze upon the groves: the people whose laboring hands have left traces on the fruit and the landscape and whose backs have carried the weight of industrial agriculture. The poems and photographs presented here dignify their labor. 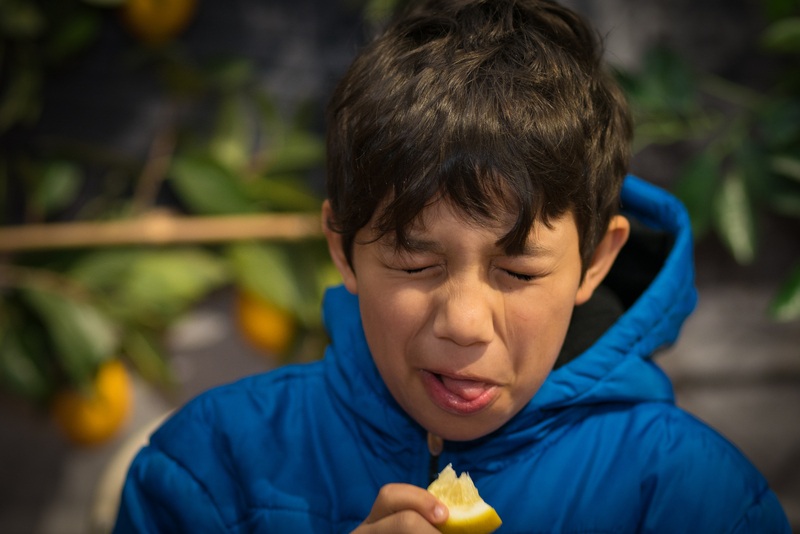 Many brave souls have bitten into the sourest of the 89 varietals of citrus at the park during tours and tastings. With Sour Puss, a series of photographic portraits staged during Sweet N Sour community festivals in 2017, artist Kate Alexandrite captured some of their expressions. Why do people close their eyes and make a face when they taste certain flavors? Some say it is evolutionary, a way to keep us from eating spoiled or poisonous food. Scientists also explain that sour flavors open hydrogen ions on our taste buds, which fire off a message straight to our brains. The face you make is also a way to share your reaction with those watching. Maybe that’s why we smile back in laughter and empathy. Like what you see? Join us for a tasting and show us your sour puss! The Relevancy and History Project was recently featured on Humanities for All, a website that showcases the full range of publicly engaged humanities work at higher education institutions across the United States. Explore their site to learn more about how nationwide publicly engaged humanities research, teaching, preservation, and programming have advanced humanities scholarship and enriched American life—building and strengthening communities; creating learning experiences for people of all ages and backgrounds; sparking dialogue; and broadening our understanding of ourselves, our nation, and our world. Check out the project spotlight here!